Preheat grill and oil the grate. Divide the meat into 6 equal portions. Lightly wet hands with cold water and form each portion of meat into a round 4- inch patty. Brush one side of the onion slices lightly with olive oil and season onions and patties with salt and pepper; place on grill. After 5 minutes, turn patties with spatula and continue grilling until nicely browned and cooked to taste. Remove grilled onions to a platter when browned and tender. Brush the cut sides of the buns with the remaining olive oil and place cut side down on the grill for the last 2 minutes. Remove the buns. 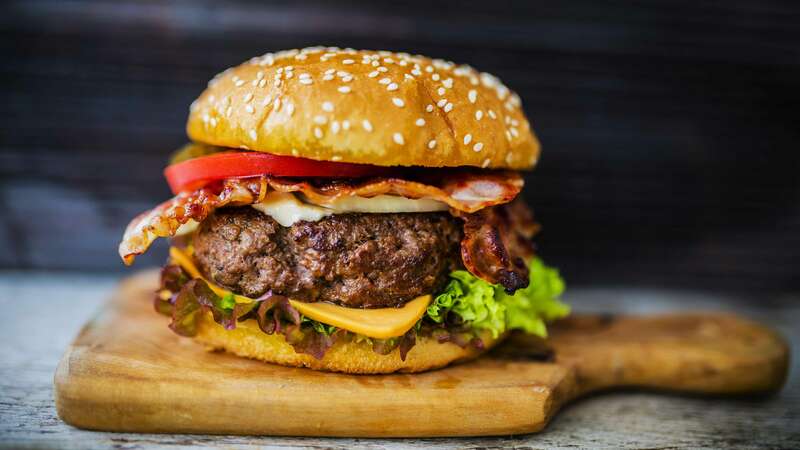 Place bottom buns face up on a serving platter and add lettuce, a slice of cheese and a hot burger pattie straight off the grill (to melt the cheese). Arrange tomatoes, pickles and bacon on the platter alongside the grilled onion so everyone can add the toppings of their choice along with ketchup, mustard and mayonnaise.